This 500 foot roll of layflat ducting is made to fit any of our 8" output ducts on our Dri-Eaz dehumidifiers, or our Dri-Eaz DefendAir HEPA 500 positive/negative air machine. 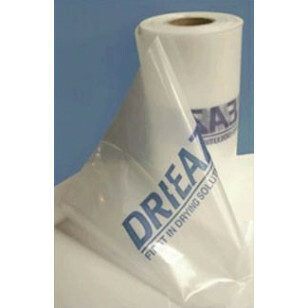 This ducting is manufactured from a strong 4-mil, lightweight poly tubing for maximum elasticity, flexibility, and strength. The 13 inch width expands to an 8" diameter when air is forced through it. Each roll carries 500 feet of tubing, which you cut to fit your application. The ducting is unaffected by moisture and most chemicals, which is ideal for water & mold damaged areas. This ducting should only be used on exhaust sides of your scrubber where air is getting pushed out, and not sucked into the machine. This is a review for the Dri-Eaz® 8" Layflat Dehumidifier & Air Scrubber Ducting.